The most efficient way to import discussions from one site to another is through Import from Site described below. You may also use Import / Export under the Manage section of Discussions to copy select forums and topics. In this tutorial, we will cover import from site. You can copy categories, forums, and topics that are flagged as ‘I’ll re-use’ from one site onto another with the Import from Site feature. Make sure that all the topics that you would like to export to a new site are tagged as “I’ll re-use” topics. To change a ‘normal’ topic to a re-usable topic so that it gets transferred with your forums upon export/import to another site, check it to select it and then click on “Re-use”. You can also get into the habit of marking topics as reusable when you create them, if you know you’ll use them next term. Note: If you forget to make a topic reusable and it doesn’t get exported/imported into your new site, return to your original site, change the topic to ‘re-use,’ and run import from site, again. The process will not import duplicate entries of what you had already handled. It will only import the new ones. Click on Site Setup and then click on Import from Site. 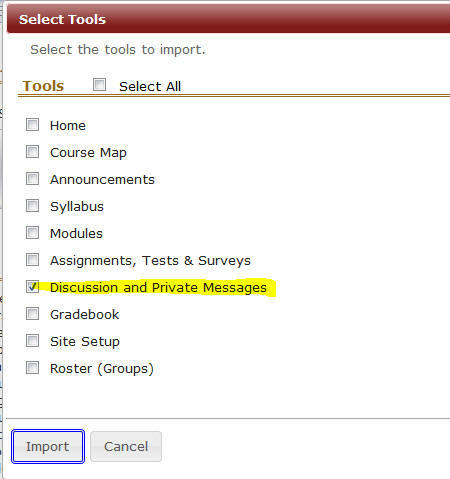 Select the site whose discussion you want to import , select Discussion and Private Messages, and click on Import. If forums and categories with the same titles exist, the imported ones are merged with them. Group forums are retained if you checked “Roster (Groups)” with import from site. Imported topics are posted with the name of the importer.